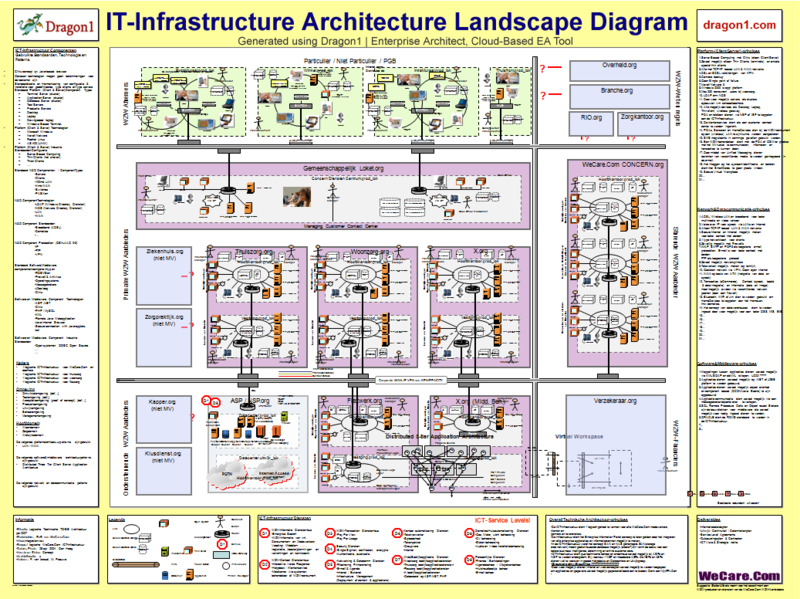 What is an IT Infrastructure Landscape? An IT Infrastructure Landscape is a simplified architecture drawing, mainly at logical level, showing the structure and workings of the IT Infrastructure in an organization. In more detail an IT Infrastructure landscape diagram is the visualization of the types of available IT Assets of an organization, i.e. the set of computer software and hardware plus 'connected' things. Arranged in a specific configuration which serves as the current or future IT Infrastructure to support the business operation of an organization, preferably in an optimal way. As an IT Infrastructure Landscape Diagram presents a technical view of IT and not a functional view. Therefore often the information systems of the organization are not visible or clear in the IT Infrastructure Landscape. Although the diagram may show many parts of the Information Systems. Here on Dragon1 you can, with one click of a button, create a IT Infrastructure Landscape diagram. Next, adjust the template to your situation. You can create building blocks for your IT Infrastructure and build up your IT Infrastructure diagram with it.